• Nonsteroidal anti-inflammatory drugs (NSAIDs) cause an increased risk of serious cardiovascular thrombotic events, including myocardial infarction and stroke, which can be fatal. This risk may occur early in treatment and may increase with duration of use [see Warnings and Precautions]. • Nabumetone tablets are contraindicated in the setting of coronary artery bypass graft (CABG) surgery [see Contraindications and Warnings]. • NSAIDs1 cause an increased risk of serious gastrointestinal adverse events including bleeding, ulceration, and perforation of the stomach or intestines, which can be fatal. These events can occur at any time during use and without warning symptoms. Elderly patients are at greater risk for serious gastrointestinal events (see WARNINGS). insoluble in water, but soluble in alcohol and most organic solvents. It has an n-octanol:phosphate buffer partition coefficient of 2400 at pH 7.4. 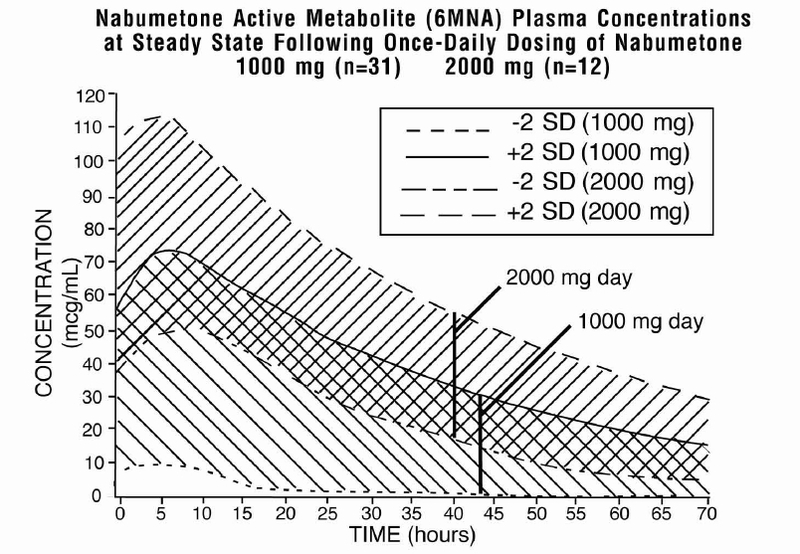 After oral administration, approximately 80% of a radiolabelled dose of nabumetone is found in the urine, indicating that nabumetone is well absorbed from the gastrointestinal tract. Nabumetone itself is not detected in the plasma because, after absorption, it undergoes rapid biotransformation to the principal active metabolite, 6-methoxy- 2-naphthylacetic acid (6MNA). 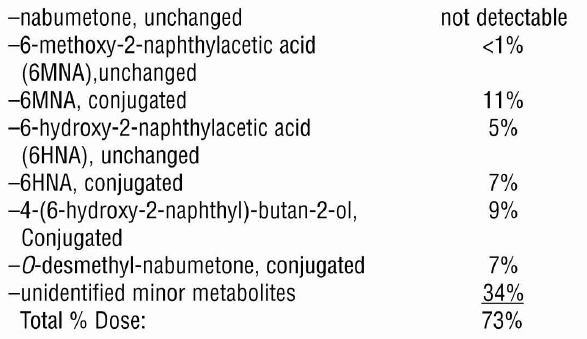 Approximately 35% of a 1,000-mg oral dose of nabumetone is converted to 6MNA and 50% is converted into unidentified metabolites which are subsequently excreted in the urine. Following oral administration of nabumetone, 6MNA exhibits pharmacokinetic characteristics that generally follow a one-compartment model with first order input and first order elimination. 6MNA undergoes biotransformation in the liver, producing inactive metabolites that are eliminated as both free metabolites and conjugates. None of the known metabolites of 6MNA has been detected in plasma. Preliminary in vivo and in vitro studies suggest that unlike other NSAIDs, there is no evidence of enterohepatic recirculation of the active metabolite. Approximately 75% of a radiolabelled dose was recovered in urine in 48 hours. • Nabumetone tablets, like other NSAIDs, can cause GI discomfort and, rarely, serious GI side effects, such as ulcers and bleeding, which may result in hospitalization and even death. Although serious GI tract ulcerations and bleeding can occur without warning symptoms, patients should be alert for the signs and symptoms of ulcerations and bleeding, and should ask for medical advice when observing any indicative sign or symptoms including epigastric pain, dyspepsia, melena, and hematemesis. Patients should be apprised of the importance of this follow-up (see WARNINGS: Gastrointestinal Effects, Risk of Ulceration, Bleeding, and Perforation: ). • Nabumetone tablets, like other NSAIDs, can cause serious skin side effects such as exfoliative dermatitis, SJS, and TEN, which may result in hospitalizations and even death. Although serious skin reactions may occur without warning, patients should be alert for the signs and symptoms of skin rash and blisters, fever, or other signs of hypersensitivity such as itching, and should ask for medical advice when observing any indicative signs or symptoms. Patient should be advised to stop the drug immediately if they develop any type of rash and contact their physicians as soon as possible. • Patients should be informed of the warning signs and symptoms of hepatotoxicity (e.g., nausea, fatigue, lethargy, pruritus, jaundice, right upper quadrant tenderness, and "flu-like" symptoms). If these occur, patients should be instructed to stop therapy and seek immediate medical therapy. • In late pregnancy, as with other NSAIDs, nabumetone tablets should be avoided because they may cause premature closure of the ductus arteriosus. **Adverse reactions reported only in worldwide postmarketing experience or in the literature, not seen in clinical trials, are considered rarer and are italicized. Do not take NSAIDs right before or after a heart surgery called a â€œcoronary artery bypass graft (CABG).â€ Avoid taking NSAIDs after a recent heart attack, unless your healthcare provider tells you to. You may have an increased risk of another heart attack if you take NSAIDs after a recent heart attack. See â€œWhat is the most important information I should know about medicines called Non-Steroidal Anti-inflammatory Drugs (NSAIDs)?